What is Building Roads Together? Building Roads Together (BRT) is a community-based peer support walking and rolling (with mobility aids) program designed to promote inclusion and reduce mental health inequities by building capacity for people to lead peer walking/rolling groups. Why is Building Roads Together important? mental health and well-being. BRT maximizes accessibility to communities facing barriers to exercising due to mental health issues and inequities associated with low income, racialized status, migration status, disability status, and other dimensions of diversity, by focusing on urban walking close to people’s homes. 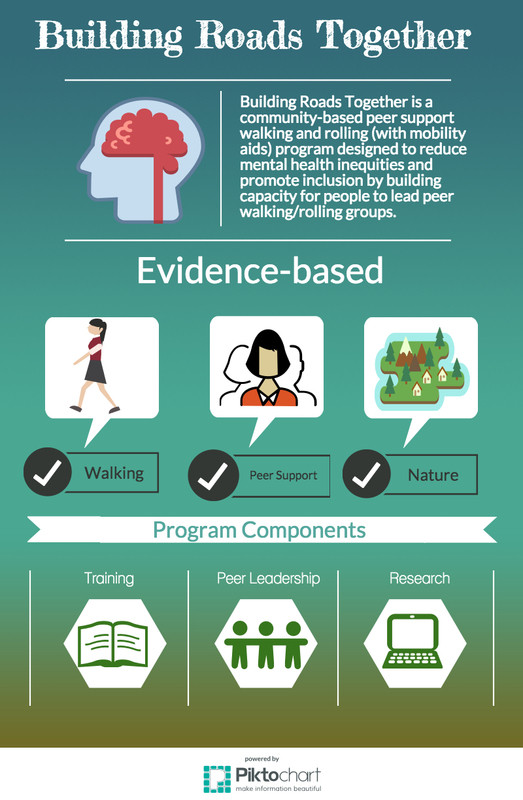 It aims to reduce mental health inequities by: a) promoting physical activity, b) building inclusive peer support networks c) building peer leadership capacity d) connecting peers to their neighbourhoods, including green spaces; e) improving neighbourhood walkability; and f) building partnerships among service providers, policymakers, and researchers. How is Building Roads Together community-based? This program has been based at Farahway Global, at the Centre for Social Innovation – Regent Park, since it’s inception in 2013. It was created and designed by Farah N. Mawani, who works there and lives on the edge of Regent Park. It benefits from an advisory committee that brings together peer group leaders, people with lived experience of exclusion and mental health issues, service providers, trainers, and researchers. Many members represent more than one of those identities. The program started with a needs assessment to learn about training needs from: service providers coordinating walking peer support groups, people with experience leading walking peer support groups, walking peer support group participants, and potential walking peer support group participants. The training curriculum is based on the needs assessment findings. To date more than 40 Regent Park residents have participated in the training program. The program is evaluating its process and outcomes to learn as much as possible from people involved in the training. Walk the Talk, a weekly walking group of project collaborators, is building the program together. Who is conducting the program? The program was created and designed by Farah N. Mawani, based on research combined with her personal experience of prolonged complex trauma and recovery. The program was piloted in Regent Park with support from a City of Toronto Community Recreation Grant in partnership/collaboration with Houselink, Regent Park Community Health Centre, TD Centre of Learning, and 416 Community Support for Women. Regent Park was selected as the pilot site to promote mental health for residents during their community’s physical and social transformation. Walking through their community with groups of peers keeps them connected to it as it changes physically and socially by the day. Shared leadership of their walking groups empowers walkers to collectively lead the shaping of their community through that change. Farah was selected as recipient of the 2015 City of Toronto Access Award for Disability Issues by a community panel; and 2015/16 Centre for Social Innovation Agent of Change: City Builder for creating and leading Building Roads Together. Building Roads Together received a Healthier Cities and Communities grant, from the Dalla Lana School of Public Health, University of Toronto, Toronto Public Health, and the Wellesley Institute, to evaluate, enhance, and expand Building Roads Together, in partnership with Dr. Sarah Flicker, Faculty of Environmental Studies, York University, and Dr. Stephanie Nixon, Director, International Centre for Disability and Rehabilitation. Love this concept. How do I find a walking group in my area? So simple, but such a powerful action. Let’s walk together. Thanks so much Cherie. We agree! And please do connect about walking with us.